identify some lessons for local authorities. Local authorities' power to set rates is essentially a power to tax people to pay for the costs of delivering the services that local authorities provide. There are tightly prescribed legal rules about how that power must be used and what kinds of rates can be set. These rules are set out in the Act and in the Local Government (Rating) Act 2002 (the Rating Act). have processes and information that allow ratepayers to identify and understand their liability for rates. A local authority's rates resolution follows the directions and policies established by the long-term plan and the detailed information and explanations in the annual funding impact statement. It is vital that these formal documents (see Figure 1) are consistent with each other and meet the legal requirements. For local authorities, failing to comply with rating law and the associated accountability requirements can create legal and financial risks, specifically to revenue from rates. The Rating Act gives some practical protection for a local authority's revenue base. It prescribes that the only defence a ratepayer has for not paying rates is that the local authority was not legally allowed to assess that rate. Ratepayers can use this defence only if they challenge the legality of the rate in the High Court. However, this requirement on ratepayers does not excuse local authorities from taking their legal obligations seriously. As public entities, local authorities need to be meticulous about their legal obligations and exercise their powers lawfully. Understanding the work that auditors do on rates requires an understanding of the auditor's role and the balance between the responsibilities of the auditor and the public entity. A public entity is responsible for ensuring that it complies with its legal and accountability obligations. For example, it must meet its detailed reporting obligations and must maintain financial and other records so that it can report accurately. In the context of setting rates, local authorities are responsible for ensuring that they comply with all aspects of the Rating Act when they set, assess, invoice, and collect rates. The purpose of an audit is to increase the confidence that readers can have in the audited information. The local authority's financial statements for the relevant financial year and information about the local authority's performance (measures of service performance) must be audited. is presented in a way that is consistent with generally accepted accounting practice. The auditor is responsible for planning and carrying out the audit to satisfy the audit's objectives. The auditor then gives an opinion on whether the information meets those objectives. "Reasonable assurance" does not mean that the auditor has tested every transaction or disclosure. Nor does it mean that the auditor looked at every aspect of the local authority's operations, activities, and processes for setting rates and collecting rates revenue. Auditors assess whether particular activities, projects, or transactions have a direct material effect on the information being audited and plan their work accordingly. The auditor's role is to provide an independent opinion on whether specific information that the public entity reports in the financial statements is reliable. An auditor can provide only reasonable assurance, rather than absolute assurance, that this is the case. Rates are a significant component of the revenue of a local authority. This is reflected in the audited financial statements. An auditor seeks reasonable assurance that rates revenue has been properly calculated and that there is no major risk to collecting rates. This requires the auditor to consider whether the legal requirements for setting and charging the main rates appear to have been followed properly. People sometimes assume that an auditor checks all of a local authority's decisions, contracts, and transactions and concludes whether a public entity is complying with all of its legal obligations. That is not correct. Audits assess the reliability of a particular set of information, not a public entity's overall activities. An audit is designed to detect material misstatements, not all errors or problems regardless of their size or significance. An audit is designed to provide reasonable assurance that the reported information is reliable, not absolute assurance that the reported information is accurate and that the work underlying the information is sound in all respects. An auditor's work on rates should give reasonable assurance that the rates revenue recorded in the financial statements materially reflects what the local authority could and has collected during the year. It cannot be taken as equivalent to a full legal review of how well the local authority complied with aspects of rating law for every rate and every ratepayer. If elected members or local authority managers want that kind of assurance, they need to get independent legal advice on their compliance and legal risk. Sometimes, an audit will identify that a local authority is not complying with a legal requirement. However, that is an additional benefit of the auditor's work rather than the main purpose. It does not mean that an audit removes the need for a local authority to ensure that it complies with all legal obligations. Three local authorities (Kaipara District Council, Tasman District Council, and Christchurch City Council) identified problems that were significant enough to warrant validating legislation. Taupo District Council formally adopted its long-term plan retrospectively to remove any question about the validity of rates set for 2012/13. Ruapehu District Council and Waimate District Council reset their rates after they identified legal breaches in their setting of rates. A request was made to the Auditor-General to consider Clutha District Council's collection of a sewerage rate for properties that were not yet connected to the sewerage system in Benhar and Tokoiti. As a result of our inquiries, Clutha District Council arranged a refund or transfer to 2013/14 for all affected ratepayers because the Council concluded that the rate had been incorrectly charged. In Tacon v Hastings District Council (2013), although the High Court did not rule in favour of the ratepayer, it did find deficiencies in the way the Council levied a targeted rate and that the Council had not fully complied with its legal obligations. This case illustrates that process deficiencies can and do occur, and that affected ratepayers will challenge local authority rating decisions if ratepayers think that the local authority got it wrong. The problems with setting rates occurred regardless of the size of the local authority. Therefore, we decided to gather some information about rating practices and problems throughout the country. We did not design or intend the questionnaire to identify all problems with the way local authorities set rates. Our questionnaire focused on rates problems that could affect the financial statements and, therefore, the audit. However, the exercise gave us good insight into overall practice and the kinds of legal problems that local authorities face when setting rates. whether local territorial authorities properly assessed and collected regional council rates on behalf of regional councils. Our work identified some rating problems for 2012/13. Many local authorities had already identified some of the legal rating problems they faced for 2012/13 and, in some instances, for previous rating years and 2013/14 (see paragraph 2.19). If, in completing the questionnaire, the auditor identified that the local authority was not, or might not be, complying with the legislative requirements, then the auditor drew that to the local authority's attention. The local authority then told the auditor whether it had considered the matter, including whether it had sought legal advice, and its views on whether it was complying with its legal obligations and the legal and financial risk that any potential problem created. modifying (by qualifying) the audit opinion on the information that the local authority presented. In deciding on the appropriate response, we considered how clear it was that there was a breach of a legal requirement, the legal risk (how likely it was that a court would invalidate the rate), and the financial risk (what kind of remedy a court might award and how much revenue was involved). We considered the nature of the legal breach and its significance in principle. We found many instances of reasonably clear legal breaches where the amount involved was small and/or the chance of a court invalidating the rate and ordering repayment seemed low. In such instances, our general approach was to refer to the matter in the management letter to the local authority. However, we did not draw attention to the matter in our audit report. Our auditors will follow up these matters in future audits. Often, local authorities sought the views of their legal advisors on these matters. However, we also found some examples of clear legal breaches that involved an important legal principle and/or for which we considered a court would be likely to order repayment. In those instances, we ensured that there was some disclosure of the problem – even if the amount was not material. In particular, we did this when we concluded that a local authority had invoiced for and collected money that, legally, it could not require ratepayers to pay. This arose when local authorities failed to include a particular rate in their formal resolution stating what rates to impose each year. If a rate was not included in that resolution, it had not been set and ratepayers could not be required to pay it. However, several local authorities had inappropriately proceeded to invoice and collect such rates revenue. From our perspective, disclosing these problems is about more than reporting on legal risk. It is also about openness and transparency and our responsibility under section 20 of the Public Audit Act 2001 to report to Parliament on information arising out of the performance of our functions. In some instances, we considered that disclosing the problems we identified was important because, in effect, the local authority was invoicing ratepayers for rates that had not been lawfully imposed and for which there was no obligation to pay. We considered it important for that to be disclosed, even though the legal risk of a challenge by ratepayers was low and unlikely to warrant the local authority taking corrective action. We note that, in some instances, local authorities chose to repay ratepayers if it later became clear that a rate had not been lawfully imposed. Our appointed auditors noted several areas where there were issues with rating practice. Our analysis of the completed questionnaires showed that most local authorities had some problems with rating compliance for 2012/13. All aspects of compliance with the rates legislation that we reviewed had problems. These ranged from potentially serious breaches of the requirements in the rates legislation (such as the local authority failing to adopt a long-term plan or to include all rates in its rates resolutions) to "technical" legal breaches (such as rating information not being included in the local authority's funding impact statement as required by the rating legislation, but included elsewhere in the local authority's long-term plan). Some of the errors that we identified were important, either because they created a significant financial risk to the local authority's revenue (such as a problem with a significant, district-wide rate) or because they involved a major legal failing (such as charging a rate that the local authority had not set). We identified errors that, despite the local authority's poor compliance with rating law, have not become problematic, because ratepayers had not challenged their local authorities on these matters. We understand that several local authorities are taking legal advice on the rating compliance issues that our appointed auditors raised with them, including whether they need to take remedial action. We found that the rates practices of most local authorities did not meet statutory requirements. Some aspects of rates legislation (such as the rates-related requirements for long-term plans, annual plans, funding impact statements, and revenue and financing policies in Part 6 and Schedule 10 of the Act) are detailed and highly prescriptive. Some of the rates requirements in the Rating Act and the Act are interrelated. This seems to have created considerable confusion for local authorities when interpreting and putting these requirements into practice. This confusion often results in local authorities failing to comply with the law. Some local authorities label and present information differently from what is explicitly required in the rates legislation. They often do this to make these documents easier to understand or to have the information in a more prominent place in the consultation documents. However, this can result in local authorities inadvertently breaching the rates legislation and being exposed to legal risk. The Act requires local authorities to adopt a long-term plan every three years. This sets out the local authority's broad plans for what it intends to do and how it will go about it. The Act requires the long-term plan to include some basic policies and specific information in specific policies. Local authorities cannot take a different approach without going back to change the policy through the proper process set out in the Act. That process involves consulting their communities. One of these required policies is a revenue and financing policy. To provide predictability and certainty about sources and levels of funding, this must state the different sources of funding the local authority will use to fund its operating and capital expenditure. The specific rates information that the Act requires to be included in the revenue and financing policy is part of the legal foundation for properly setting rates each year. If information is missing − and we found this to be a common problem − a rate might be at legal risk. Local authorities need to ensure that each rate in the rates resolution fits within the local authority's revenue and financing policy, and that the revenue and financing policy properly supports the rates resolution. Some local authorities had poor, deficient, or questionable rates practices, particularly with their processes for setting rates. A local authority formally authorises specific rates to be imposed on the community each year through a rates resolution. Some local authorities do not seem to appreciate that the rates resolution is a critical legal document, rather than just another step to implement policy decisions that were made during the planning process. We were especially concerned when we identified rates that were proposed in the local authority's funding impact statement, not included in the resolution, and then invoiced and collected from ratepayers. We saw instances where rates documents had not been updated to show the local authority's actual intended rates. For example, the funding impact statement might have been updated to reflect the local authority's intentions but not the rates resolution, or the other way around. Because the rates-setting documents are so important, it is essential that local authorities have appropriate quality review processes to give assurance that rates are set in keeping with the law. We were told that some local authority managers were not receiving − and elected members were not asking for − assurances from staff or the local authority's independent legal advisors that adequate work had been done to ensure compliance with rates legislation. Some local authorities relied on work carried out some years previously. Many of the problems we identified seem to have arisen because not enough attention was paid to the detail of legal requirements and changes to those requirements. Some local authorities had many problems with rating compliance, which raises questions about their practices. The ability and power to rate comes with obligations that need to get appropriate attention. made errors − such as decimal points in the wrong places in rates amounts and typographical errors − suggesting inadequate checking. Some regional councils have territorial local authorities collect rates on their behalf but did not get assurance that rates were collected in keeping with the regional council's intentions. Sometimes, there was confusion about the responsibilities and roles of regional and territorial local authorities. Many local authorities did not meet some of the main statutory purposes and objectives of the Rating Act, which are intended to allow ratepayers to easily identify and understand their liability for rates and to provide clarity, certainty, and stability in rating matters. Many local authorities did not clearly describe, explain, and include information about rates in their long-term plans and rates resolutions. A local authority's rates resolution is critical to setting rates. The rates resolution is how the local authority formally authorises specific rates imposed on the community each year. It is equivalent to a taxing statute. In general, courts strictly interpret coercive powers of this kind and their associated legal duties. The Rating Act sets out the procedure that local authorities must follow when setting annual rates. Complying with the detail of the Rating Act is vital. If the rate is not within the range of options and restrictions provided for in the Rating Act, it might not be valid. Therefore, local authorities need to be meticulous in ensuring that their processes for resolving to set rates comply with the procedural requirements and that their rates resolutions are legally effective. Some local authorities had poor, deficient, and questionable rates-setting processes and practices, particularly for resolving to set rates. If continued, these practices could invalidate the rates. Two local authorities are promoting rates validation bills after identifying serious legal breaches in their processes for setting rates. The local authorities identified these legal breaches before the auditors completed the questionnaire on rates. Christchurch City Council failed to set a due date when it set its rates for all years from 2004/05 to 2013/14. The rates resolutions omitted the rates instalment dates and a provision for charging penalties. This meant that the rates never became legally due (and so were unenforceable) and that penalties could not be charged. After taking legal advice, the Council resolved on 19 September 2013 to reset the 2013/14 rates. It is promoting a bill to validate the rates and penalties it did not include in rates resolutions for previous years but collected from ratepayers. The Council disclosed these breaches in its financial statements for 2012/13, and our audit report drew the reader's attention to the Council's disclosures. Taupo District Council identified a risk that it might not have properly adopted its 2012-22 long-term plan in line with the Act. Without a validly adopted long-term plan, the Council could not legally set its 2012/13 rates. After taking legal advice, the Council formally adopted its long-term plan on 24 September 2013. It is promoting a bill to validate rates and penalties collected from ratepayers for 2012/13. The Council disclosed these legal breaches in its financial statements for 2012/13, and our audit report drew the reader's attention to the Council's disclosures. Ruapehu District Council had to meet on three separate occasions to resolve to set rates for 2012/13 because of errors in funding impact statements and rates resolutions. Waimate District Council failed to resolve to set rates and penalties for 2012/13 and had to reset them in line with the Rating Act on 11 June 2013. The Council refunded or reversed all penalties charged for 2012/13. Chatham Islands Council used wording in its annual rates resolution to set a water-targeted rate that differed from its intention to rate all properties connected to the Council's water supplies. The Council charged the rate to all water supply connections, but its rates resolution set the rate for water supply connections to properties in only one of the two main townships. The auditors of at least six other local authorities questioned whether the resolution was clear enough to ratepayers. In one instance, the process for making the rates resolution was so unclear that external lawyers had to review the transcript of the Council's meetings about setting rates, not just the papers and minutes, to assess the Council's legal risk. In all of these instances, the local authorities' poor rates-setting practices were considered unlikely to invalidate rates. However, the local authorities needed to improve their practices to avoid the risk of invalidating future rates. Each year, a local authority adopts a funding impact statement as a central part of its planning. The funding impact statement is contained in the local authority's annual plan or long-term plan (in a long-term plan year). The Act sets out the disclosures required in the funding impact statement. In effect, the funding impact statement tells the community what that year's rates will be, how they will be calculated, and what they will be used for. Every rate in the annual rates resolution must be covered in the local authority's funding impact statement for that year. There must be enough background detail to allow ratepayers to work out what rates they will have to pay. Gaps in the funding impact statement information could put the rate at legal risk. Similarly, if the wording and specification of the rates in the rates resolution differs from the wording of the funding impact statement, that difference could raise questions about the legality of the rates. the funding impact statement contains all the information that the Rating Act requires so that it properly supports the rates resolution and all rates are set validly and lawfully imposed. Many local authorities had problems with the content of their funding impact statements, and some funding impact statements were not clearly identifiable in long-term plans. Many long-term plans included funding impact statements with names such as "Rating Policy", "Rating Charges", "How We Raise Rates", and "Funding and Financial Policies". Many local authorities explained that they renamed their funding impact statements to make them easier for ratepayers to see in their long-term plans. However, "funding impact statement" is a statutory term that must be used consistently. Many local authorities were not aware that changing the name of their funding impact statements could breach the Rating Act. 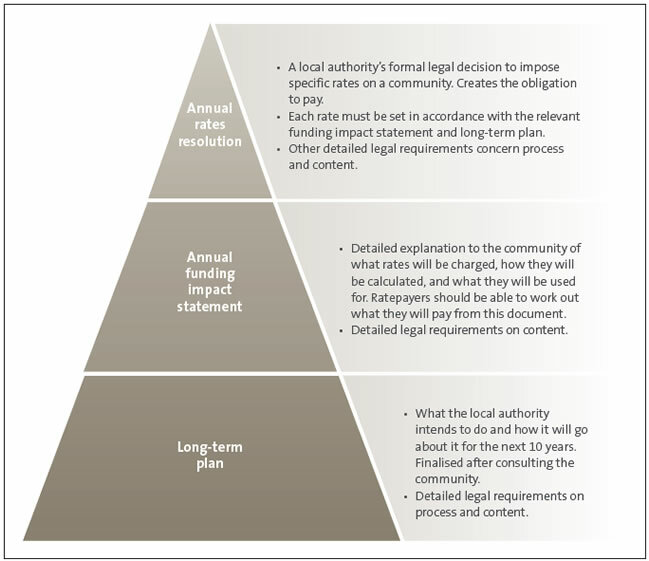 Figure 2 lists the types of non-compliance we found with the Rating Act that could put the legality of the rates at risk. In some instances, auditors identified problems that, in our view, were likely to invalidate rates. Because of the significance of the problems, the local authorities disclosed the breaches of rates legislation in their financial statements. If they had not disclosed these breaches, the auditor would have had to consider whether to issue a non-standard audit report. Grey District Council's rates resolution, which formally set the uniform annual general charge, applied a "per unique rating assessment". This term is not defined or used elsewhere. Under the Rating Act, a uniform annual general charge has to be set for every rating unit or for every separately used or inhabited part of a rating unit. The Council's funding impact statement states that the uniform annual general charge is to be calculated for every separately used or inhabited part of a rating unit. The rate had not been set in line with the funding impact statement as required by legislation. Certain targeted Matamata-Piako District Council rates were not included in the rates resolution but were included in the funding impact statement and were charged. Nelson City Council did not set the wastewater targeted rate and the separate general stormwater/flood protection targeted rate in keeping with its funding impact statement. The wording used for these rates in the Council's resolution differed from that used in its funding impact statement. Waikato District Council charged some targeted rates that were included in the rates resolution but not in the funding impact statement.1 There were also discrepancies between the rates resolution and the funding impact statement for some of Wairoa District Council's rates. In two other situations where there were discrepancies between the rates information in the rates resolution and the funding impact statement, the local authorities refunded the amounts collected but did not disclose the legal breach in their financial statements. Every three years, a local authority prepares a long-term plan, which sets out broad plans for what the local authority is intending to do and how it will go about it. The Act requires the long-term plan to include some basic policies. The Act requires particular information to be included in specific policies. When a local authority sets rates each year, the Rating Act requires them to be in line with the long-term plan. This requirement covers the activity and use of funds that fit within the long-term plan and the proposed source of funding and means of raising revenue signalled in the long-term plan. A local authority's revenue and financing policy states the different sources of funding the local authority will use to fund operating expenses and capital expenditure. Local authorities cannot take a different approach without changing the policy through the proper process. The local authority's revenue and financing policy is likely to be a more general document designed to endure. However, the Act requires the revenue and financing policy to include specific information on rates. This information is part of the legal foundation for setting rates properly each year. If information is missing, the legality of a rate could be at risk. The requirement for consistency between the rates resolution, the funding impact statement for the year, and the revenue and financing policy in the long-term plan is fundamental. This consistency links community consultation to the rates that ratepayers are required to pay. As well as ensuring that the rates resolution is in line with the funding impact statement, local authorities need to ensure that the rates resolution is in line with the long-term plan, that each rate fits within the local authority's revenue and financial policy, and that the revenue and financing policy properly supports the rates resolution. In one instance, a local authority identified a risk that it might not have properly adopted its final long-term plan, which could affect the validity of all rates in the district. In some instances, local authorities' long-term plans and/or revenue and financing policies did not contain everything needed for the rates in the resolution to be validly set. We found many discrepancies between, and conflicting descriptions of, the information contained in local authorities' revenue and financing policies and the information contained in other important rates documents, such as rates resolutions and/or funding impact statements. Another common example of poor practice – and, in some instances, non-compliance − involved the Rating Act's requirements about general rates. If the local authority's source of funding includes a general rate, the funding impact statement needs to state whether a uniform annual general charge is to be included and, if so, to set out the local authority's definition of a "separately used or inhabited part of a rating unit" if the charge is to be calculated on that basis. We found confusing references to, and practices for, describing and applying the statutory term "separately used or inhabited part of a rating unit". For example, we found widespread incorrect references to the statutory term "separately used or inhabited part of a rating unit" in many long-term plans and funding impact statements. We also found many conflicting, incorrect references in funding impact statements and rates resolutions (see Figure 3). Some local authorities' definitions of "separately used or inhabited part of a rating unit" differed between their rating documents. In some situations, local authorities collected their uniform annual general charge on the basis of a separately used or inhabited part of a rating unit, but it was not clear from their rating documents that the charge was to be calculated on this basis. For example, the resolution stated it was charged for each rating unit but the funding impact statement stated it was charged for each separately used or inhabited part of a rating unit, or the other way around. Some local authorities did not specify the basis on which some uniform annual general charges were calculated. We were concerned about the extent of these incorrect descriptions, references, and practices for calculating and applying the uniform annual general charge. Some of them could invalidate the local authority's ability to collect the charge. The extent of the problems suggested poor work practices and a lack of rigour in setting rates. During 2012/13, Environment Canterbury identified that it had set the uniform annual general charge on the basis of both a rating unit and a separately used or inhabited part of a rating unit, reasoning that individual local territorial authorities would choose one or the other basis. However, the legislation requires the charge to be calculated on only one of the two permitted bases. The method chosen must be consistent throughout the region. This resulted in a legal risk to Environment Canterbury, which it disclosed in its annual report. The Rating Act sets out specific legal requirements that local authorities must follow to be able to charge and collect penalties from ratepayers. Sometimes, the amount expected to be collected as penalties can be material to the financial statements. Local authorities need to ensure that they comply with these procedural requirements and that their penalties resolutions are legally effective. Waitomo District Council incorrectly charged and collected rates penalties when, in our opinion, it had not explicitly set penalties as required by the Rating Act.2 The Council disclosed this matter in its financial statements. We found many examples in rates resolutions of poor observance of the explicit statutory requirements of the Rating Act authorising penalties to be added to rates. In some instances, these could invalidate imposing and collecting penalties. Some local authorities failed to explicitly specify in rates resolutions the dates that penalties would be added to rates, as required by the Rating Act. Local authorities need to strictly comply with these requirements to avoid legal challenge or risk to the validity of the local authority's ability to add and collect penalties on rates. not enough and inconsistent ratepayer information for calculating targeted water rates for water supply schemes and omitted information (such as water availability charges and water-by-meter charges). Many local authorities did not pay enough attention to the legal requirements, and had poor and incomplete processes, for lump-sum contributions. For example, if a local authority intends to collect targeted rates through a lump-sum contribution, then certain disclosures must be made in rates documents. We found instances where this information was missing. We found discrepancies with whether individual and total rates included or excluded GST. Some local authorities showed their rates amounts as including GST in one rating document and as excluding GST in another. Local authorities face a potential financial risk if the GST information and calculation is not disclosed accurately in their rates documents and calculated and charged consistently. not enough information in rates notices and invoices, conflicting rates information in funding impact statements and invoices, and not enough attention to the explicit legal requirements for local authorities' rates-invoicing practices. Local authorities need to consider ways of ensuring proper compliance with technical legislative terms that have precise meanings, while communicating effectively with the community. In practice, this means carefully preparing consultation documents and processes to find a balance that complies with the legislation and that is easy to read and understand. Local authorities are responsible for ensuring that they comply with the Rating Act. It is important that local authorities use their legal powers to impose rates properly. Many local authorities responded to our questions with "near enough is good enough". They also did not distinguish between the question of whether they had followed the law and the question of whether there was a substantial risk of legal challenge or granting of a remedy. In our view, near enough is not good enough. In general, local authorities need to work harder to address and considerably improve how they set rates and document their rating practices. It is not acceptable for a public entity to work outside the law because the risk of someone taking it to court is low. Complying with legal obligations is not only about the risk of being challenged but also vital for maintaining and keeping the public's trust. The Rating Act's purpose is to ensure that rates are set in a transparent and consultative manner. If local authorities get their rates-setting processes wrong, they need to consider disclosure to ensure that rates are set transparently and openly and to reduce their legal risk and the need for corrective action. A clear process for setting rates should allow ratepayers to identify and understand how much rates they are liable to pay. The problems that we identified showed that consultation documents did not give ratepayers adequate information about their rates. Therefore, there is a risk that some ratepayers do not get an opportunity to express a view on the rates proposed. Local authorities need to be meticulous about regulatory compliance with all their statutory obligations. Local authorities are responsible for correctly meeting the statutory objectives and obligations under the Rating Act. The consequences and effects on ratepayers will vary. Ratepayers and the legal system will hold local authorities to account. The greatest risk to local authorities in not addressing poor practice problems with how they comply with the Rating Act is that anyone can then challenge the validity of rates through the High Court. Local authorities should remove any uncertainty or ambiguity about the validity of rates and their processes for setting rates. Every year, local authorities need to consider the common matters we have identified and, if needed, assess and rectify rates documents. 1: Auditors identified similar issues with Rangitikei District Council's rates, specifically its district-wide uniform annual general charge, as well as its libraries, stormwater, and water rates. This was considered at a different stage of the audit process and after the annual report had been completed. 2: There were other instances where penalties were incorrectly charged and collected. Taupo District Council had no long-term plan, so it had no authority to charge and collect penalties. However, the Council did seek to set penalties in line with the Rating Act, and its penalties would not have been at risk if the Council had adopted the long-term plan. Christchurch City Council had no authority to charge and collect penalties because it omitted information about penalties from the rates resolution.